In their latest foray into the iPhone apps market, National Geographic is bringing in their version of the World Atlas. This iPhone app lets you view 7 different levels of cartography, 3 maps styles and a location finder around the world containing 7 million place listings. In addition, the app also makes use of the Bing Maps platform, embedded right into the heart of the said iPhone application, even serving as a mapping option. National Geographic claims that its iPhone app utilizes the “highest resolution” press ready images. Hence giving you the same rich details and graphics quality of the maps it actually has on the printed, published world maps and atlases. In addition, their iPhone app als features a built-in search tool and places directory to help you easily locate even the most remote places eer known to mankind. High resolution National Geographic cartography, the same used to print our award-winning wall maps and bound atlases! Easy-to-use and fast place name search tool, with over 6 million database entries (major cities index is preloaded; full search requires internet or cell connection). World Flags and Facts database, expertly edited and up-to-date with concise socio-economic and geographic data. Push pin tool enables you to mark, annotate, and save your favorite places. Push pins come in a variety of colors and can tap into your iPhoto library or camera. GPS enabled iPhones can center the maps to show your current location. 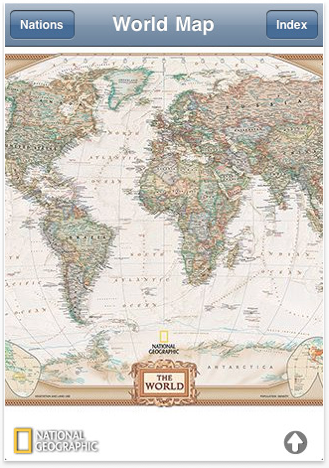 The National Geographic World Atlas for iPhone will cost you $1.99. You may download the iPhone apps from this iTunes Link.